Twins outfield stud Byron Buxton may not have been as productive over the past couple weeks as his prospect ranking suggests, but he can still change a game in a heartbeat. The next time he does just that, he'll be hearing the applause and adulation from a new set of fans. Buxton was promoted to Double-A New Britain on Monday evening, soon after homering and plating three runs in the Class A Advanced Fort Myers Miracle's 4-3 loss to the host Palm Beach Cardinals. The move was confirmed by Twins director of baseball communications and player relations Dustin Morse. Many expected Buxton to start 2014 with the Rock Cats after he hit .334 with 12 homers across two levels between Fort Myers and Class A Cedar Rapids. But that plan got put on the back burner when Buxton hurt his wrist diving for a fly ball in Spring Training. Now Buxton will get his shot to make his long-awaited debut with the Rock Cats, who start a seven-game homestand Tuesday night. With 23 games remaining in the regular season, it's likely Buxton will get around 85 to 90 more at-bats before the end of the year. Five games below .500 at 57-62, the Rock Cats are unlikely to factor in postseason play. Buxton, who turns 21 in December, will become the youngest position player on the team. Only right-handed pitcher Jose Berrios, who turned 20 in May, is younger. The Eastern League average is 24 years old. On Monday evening, Minnesota's top prospect clubbed Silfredo Garcia's 1-1 pitch for a two-run homer to left field in the fourth inning, and he was hit by a pitch above his left hip with the bases loaded to force home a run in the second. He struck out swinging in the fifth and flew out to center field to end the seventh before rain caused the game to be called. It was Buxton's fourth homer of the season and first in 18 games. It also gave him his first RBI since July 30, stopping a run of nine contests without driving in a run. His three RBIs tied a season high. It's not the first time the 20-year-old has homered and been hit by a pitch this year. Three weeks ago, Buxton cleared the fences and was later hit by a pitch on the wrist, but he remained in the game and played center field for all 17 innings of an 11-7 loss to Daytona. On Monday, he also stayed in the game and did not need any on-field treatment, according to the team. Cardinals starter Garcia, who hit Buxton, also threw behind Travis Harrison in the fifth, leading to the pitcher's ejection and a clearing of the benches. It has been a tough season for Buxton, who didn't get into his first game until May 4 and then had to miss another eight weeks after reinjuring the wrist that originally kept him sidelined for the first month of the season. 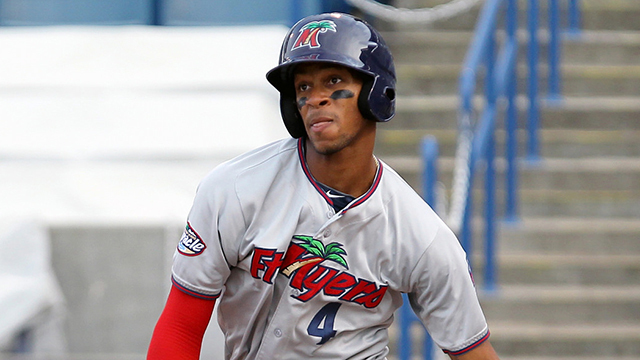 Selected by the Twins second overall in the 2012 Draft and ranked first overall among MLB.com's top prospects, Buxton batted .240 in 30 Florida State League games. Fort Myers starter Matt Tomshaw (9-5) allowed four runs on six hits and three walks over six innings in the loss. Palm Beach's Thomas Lee (8-3) worked around a hit and a walk while striking out two batters over 2 1/3 innings of relief to earn the victory. Shortstop Greg Miclat smacked a two-run homer and designated hitter Aledmys Diaz chipped in a solo shot, his second for the Cardinals.